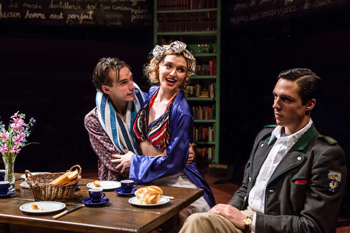 ‘French without tears’ was written in 1936 and is very much a play of its time, set in the kind world inhabited by the likes of Noel Coward, Oscar Wild and P.G. Wodehouse, where the wealthier elements of society live fashionable, sophisticated lives with only a vague awareness that some other sections of society have to work for a living. The play is not a social commentary but deals in a light-hearted way with the etiquettes and nuances underlying surface relationships amongst a group of young Englishmen learning French. In the words of Dan Rebellato of the Royal Holloway, University of London, this is a comedy of manners but Rattigan aimed for more realistic observations of life than the frivolities of the likes of Coward. ‘French without tears’ may not have incisive wit of a plays like ‘Present laughter’ and ‘Hay Fever’ but the play is not a farce and against a familiar backdrop of unspoken desires and rivalries for affections are some keen observations about masculinity, which provide a strange resonance to today’s changing world in which a host of major Western countries have almost simultaneously found themselves being lead by women whilst certain male politicians in the European parliament have resorted to fisticuffs and then blamed the other for starting it. The language and phrasing of this play may sound archaic to many and the timing reflects an age when the pace was slower but there is a constant energy to ‘French without tears’, with sharp dialogue carried by an excellent cast. The overall production was very stylish, presenting an authentic image of a country house in the 1930’s, with excellent costuming and hairstyles to match. Florence Roberts shines as stylish and glamorous Diana Lake with Joe Eyre with a great performance as the outwardly confident Kit Neilan. Mention must also be made of David Whitworth who endearingly played the mature tutor, Monsieur Maingot. All performances were good and the actors gave the impression that ‘French without tears was fun to perform. Plays like this need to be revived from time to time not just as fun entertainment but as living records of bygone times and manners running alongside perennially relevant themes and issues. This was an enjoyably night and very much a visual spectacle as well as a very well performed piece.